Mini SAS High Density (HD) is the newest member of Serial Attached SCSI interconnect family. This new system extends passive cable distances to 20 meters, greatly increasing the length and bandwidth of standard Mini SAS cables. These cables exceed the SAS 2.1 and SFF-8644 specifications. All Mini SAS HD connectors have 4-channels, and are capable of connecting 4 devices and can fan-out to single channel connections. Elpeus offers a complete selection of internal and external Mini SAS HD cables. Our cables are made with superior quality Madison and Leoni cable. We can build custom Mini SAS HD cables to your specified length or wiring. We offer competitive pricing. Mini SAS High Density (HD) is the newest member of Serial Attached SCSI interconnect family. This new system extends passive cable distances to 20 meters, greatly increasing the length and bandwidth of standard Mini SAS cables. These cables exceed the SAS 2.1 and SFF-8644 specifications. 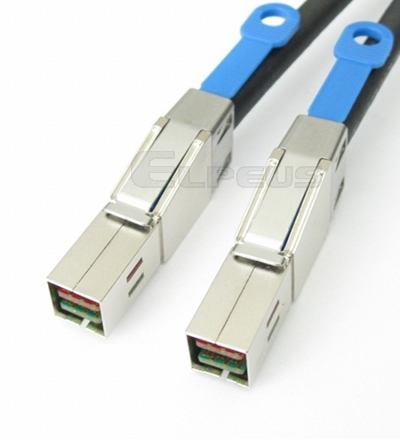 Custom lengths and hybrid cables options are available. 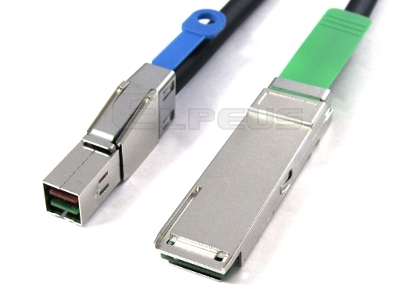 Mini SAS High Density (HD) SFF-8644 to Mini SAS SFF-8088 hybrid cables are the newest addition to Elpeus Serial Attached SCSI interconnect family. This new cable extends passive cable distances to 20 meters, greatly increasing the length and bandwidth of standard SAS cables. These cables exceed the SAS 2.1 and SFF-8644 specifications. Custom lengths and wiring options are available. Mini SAS High Density (HD) SFF-8644 to Internal Mini SAS SFF-8087 Hybrid cables are the newest addition to Elpeus Serial Attached SCSI interconnect family. This new cable extends passive cable distances to 2 meters, greatly increasing the length and bandwidth of standard SAS cables. These cables exceed the SAS 2.1 and SFF-8644 specifications. Custom lengths and wiring options are available. 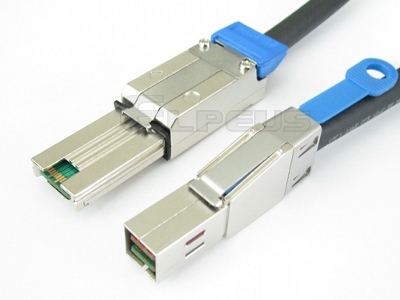 External Mini-SAS HD to QSFP+ cables maximize speed and port density for adapter cards, servers, and switches. 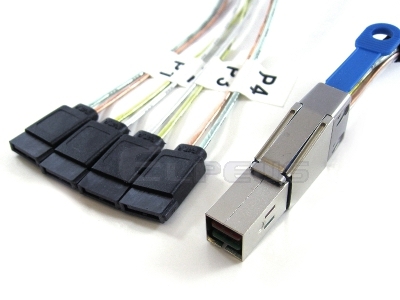 These Mini SAS HD cables are guaranteed to perform at data-rates of 6.0 Gbps per lane, and features a SFF-8644 pull-to-release connector on one end an SFF-8436 QSFP+ connector on the opposite end. Elpeus External Mini SAS HD SFF-8644 to (4) SFF-8482 breakout cables maximize storage interconnection performance and space. This Mini SAS HD to (4) SFF-8482 hybrid cable is guaranteed to perform at speeds of 6.0 Gbps per lane and features a SFF-8644 pull-to-release connector on one end and (4) SFF-8482 connectors on the opposite end. 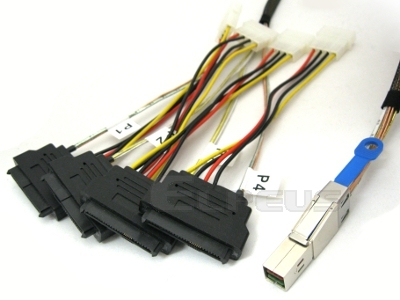 This cable features Mini SAS HD SFF-8644 connector on one end, and 2 x External Mini SAS SFF-8088 connectors on the other end. Applications include InfiniBand, Serial Attached SCSI, and PCIe. We offer standard lengths of 1 to 5 meters. Custom lengths are available. 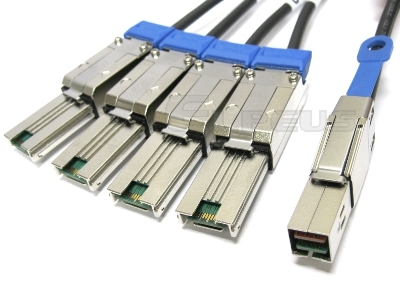 This cable features Mini SAS HD SFF-8644 connector on one end, and 4 x External Mini SAS SFF-8088 connectors on the other end. Applications include InfiniBand, Serial Attached SCSI, and PCIe. We offer standard lengths of 1 to 5 meters. Custom lengths are available.